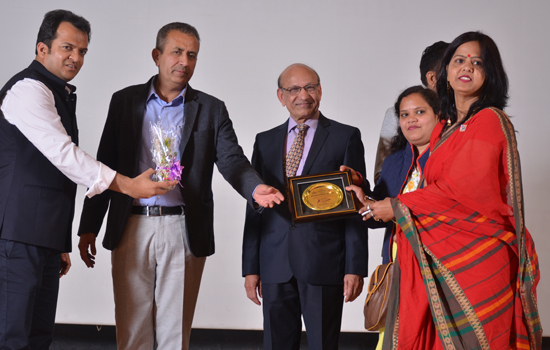 Udaipur.Geetanjali Cancer Centre in association with Geetanjali Medical College & Hospital had organized a “2nd Cancer Awareness Program and Survivors Meet 2019” at Geetanjali Auditorium. The program was based on the WHO theme “I am I will”. The program was aimed to gather cancer survivors who have fought against cancer as a warrior. The program witnessed some of the great dignitaries of Udaipur including Divisional Commissioner of Udaipur Mr. Bhawani Singh Detha as chief guest, Executive Director of Geetanjali Group Mr. Ankit Agarwal, Vice-Chancellor Geetanjali University Dr. R K Nahar, Geetanjali Medical College & Hospital’s Medical Superintendent Dr. Narendra Mogra & CEO Mr. Prateem Tamboli as guests of honor. The program commenced with lamp lightning before Maa Saraswati by the dignitaries and the prayer “Teri Panah Me” sung by marketing executives of GMCH. Surgical Oncologist Dr. Ashish Jakhetiya presented an awareness session on cancer through a power point presentation. He said every day 3000 new cancer patients are being diagnosed in India. Globally, this figure is 1 crore approximately, out of which 33 lacs patients can be treated well and can be saved from cancer. It only requires timely intervention and prevention. Cancer can be treated well if it is diagnosed early. Also, a glimpse of Cancer Survivorship program organized in 2016 was shown through a video, which had made every participant very enthusiastic. Cancer Survivor Jeevan Prajapat Father’s said that cancer is treated. One should not get scared of it. On diagnosis of cancer, he was also shattered but he didn’t lose hope and visited Geetanjali Cancer Centre. Now, after two years of complete treatment, he is completely fine and good and had greeted doctors with a big bunch of thanks. Pali resident Badri Singh said that her granddaughter Yogesh Kunwar was suffering from a tumor in the throat to which they had gone to Ahmedabad for treatment. But there was no relief; Then, they came to Geetanjali Cancer Centre where Yogesh was operated for a tumor in the throat. Yogesh is completely fit and healthy and feels very good and happy same as she would have felt on receiving any prize in school. An 8th standard grad, Pooja Kunwar was suffering from a tumor in the throat and was treated well in Geetanjali Cancer Centre two years back. She recovered well. Recovered well from the fourth stage of mouth cancer, Hemendra Kumar Sharma played music on harmonium and presented a message that music helps cure many diseases. 14 years old kiddo, Prem Kumar Meena said a poem titled “Ye mat Kaho Khuda ki mushkile badi he” which had astounded the audience. He was treated well in Geetanjali Cancer Centre two years back and is completely healthy now. 71 years old Vimala Jain said that she is fighting from cancer for 38 years. She was 32 years when she was first diagnosed from breast cancer. After that every five years, she was diagnosed with cancer in different body organs. But she never lost hope and is still fighting with cancer. Getting treated at Tata Memorial Hospital she will continue her treatment at Geetanjali Cancer Centre. Her story is really an inspiration to all. Passionate about dance, 8 years old Khushi Jat was diagnosed with throat cancer. She underwent radiotherapy at Geetanjali Cancer Centre and had been saved from an operation. DC Kothari from muskan club motivated everyone by saying that we should not be scared of cancer. It’s a disease which can be treated and can be fought against it. Cancer survivors Paresh, Khushi, Bhavika, and Prem Kumar Meena presented a beautiful dance on “Chakh Dhoom Dhoom”. Also, a very encouraging dance was presented by day-care nursing staff and song by Insaniyat Group which had received a huge round of applause by the audience. This program also witnessed the unveiling of “Geetanjali Cancer Survivor Group” which aims to gather the cancer survivors every 3 or 6 months to spread awareness on cancer and other related diseases. The program was anchored by Onco Coordinator Mamta Purohit and 92.7 Big FM’s RJ Anshuman and vote of thanks was given by Dr. Ramesh Purohit.